Fifty years ago, the American South was aflame, as the growing Civil Rights movement clashed with bigotry, hatred, and violence from too many in local communities that had been raised to assume the colour of someone's skin said more about who they were and what they were capable of than their actions or what was in their heart. Fear of the unknown, of change, of an upturning of the "way things have always been," fuelled prejudice and lead to horrific atrocities. Canadian author Craig Shreve delves into this turbulent time, and its ongoing impact, in his novel ONE NIGHT IN MISSISSIPPI, an assured debut that's both tender and brutal, thought-provoking and heart-breaking. An absorbing story of two brothers: one who tries to "accept his place" and enjoy life, another who strives to change things for the better. Warren Williams is a drifter, an itinerant soul troubled by his past. But a half century ago he was a young boy trying to survive in the rough and tumble world of rural Mississippi, working hard to help his father on the family cotton farm. Proud, but realistic, he was bemused, inspired, and annoyed by his younger brother Graden's attempts to better himself intellectually, to forge a life beyond a hand-to-mouth blue-collar existence. Shreve nicely captures the mixture of sibling bond and rivalry, as he bounces between contemporary times and the brothers' life growing up in 1960s Mississippi. As Graden grows into a young man at the time of the Civil Rights movement, he's inspired by the likes of Dr Martin Luther King Jr, and looks to galvanise local black people to take a stand. His efforts are cut short when he's lynched. Corroded by guilt, Warren sees the perpetrators walk free from court; a shameful sign of the times. Years later when the US Justice Department begins reopening cases, he finds purpose in helping bring Graden's killers to justice, building to a surprising showdown in northern Ontario with the last killer standing, Earl, who was just a boy himself at the time. 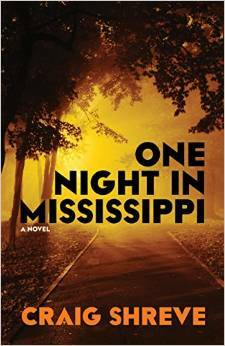 ONE NIGHT IN MISSISSIPPI is a short but powerful novel. Shreve does a great job evoking 1960s life in the changing rural scene, and giving us insights into characters that are more complex and layered than just, pardon the pun, black and white. We see things through the eyes of Warren, but also Earl, two men who've lived with the guilt and consequences of an abominable tragedy that occurred when they were mere boys. We scratch behind the images from history to see something of the personal stories and perspectives, the complex nature of the times. Were white northerners coming to the South full of good intentions to help black people secure voting rights a good thing, or horribly naïve? Did the black community muzzle and frustrate some of their own leaders just as much as vocal and violent rednecks? Shreve, who is a descendant of a nineteenth-century anti-slaving activist and was born and raised in North Buxton, an Ontario town that provided a safe end-point for slaves escaping on the famed Underground Railroad, raises plenty of thought-provoking questions while delivering a page-turning tale, and avoiding falling into caricatures or cliché. At times confronting, ONE NIGHT IN MISSISSIPPI is reminiscent of excellent screen stories like Ghosts of Mississippi and Mississippi Burning, while still being a unique, valuable tale in its own right. Shreve does a great job at unpacking some of the layers beneath the headlines and historical footnotes, and makes us care about his characters. I reviewed this book for Reviewing the Evidence, a terrific crime fiction review website. This fine debut novel is also my 'Mississippi' book for the USA Fiction Challenge.